I've now been sick for 1 week. Although I still partied like it was my job at my brother-in-law's wedding, I've also been employed by the cough monster. Or 'the mongus' as Shaun likes to call it. I'm so beyond over not sleeping due to Cough Fest 2011. I'm drinking tea, swigging Robitussin and downing cough drops like nobody's business. Luckily, I got an antibiotic yesterday but admittedly, it hasn't helped much in the way of feeling better...yet. What am I going to make for this party? I really, really need to have some marshmallow dip. It needs to happen. I could totally just cut up fruit for the dip. That would work. It's not that fun...but it would definitely work. What if I put the fruit on a pop? Everyone likes everything better on a pop. Right? Is that too boring to bring for a party? I have a rep to protect. Ooh, my kitchen floor really needs to be mopped. Probably not going to happen though. Maybe I could dip the fruit pops in the marshmallow sauce and display them pre-dipped. But it probably won't harden. I'd have a runny marshmallow mess. Duh. You know what does harden? Chocolate. Yep. Chocolate dipped pops. With marshmallow dipping sauce. It has to happen. Immediately. So with that in mind, I made these for a barbecue at Shaun's parent's house and later for my cousin Veronica's engagement party. I hope you enjoy them! First prepare your display. Wrap up a piece of styrofoam with wrapping paper to make it look pretty. For Veronica's party, we used white and silver 'love' paper since it was an engagement party. You could do so many fun things with the paper! Holidays, birthdays, kids' parties...Keep it near your work station so that the pops can go right into the foam board as you dip them. To make the pops, cut up all of your fruit. Let rest in a paper towel-lined bowl or dish. This will help dry the fruit so that it won't be too wet when dipping into chocolate. Next, melt the chocolate. Place chocolate and a bit of canola oil in a bowl. I then heat it in the microwave at small intervals, stirring the chocolate in between each interval until completely melted. 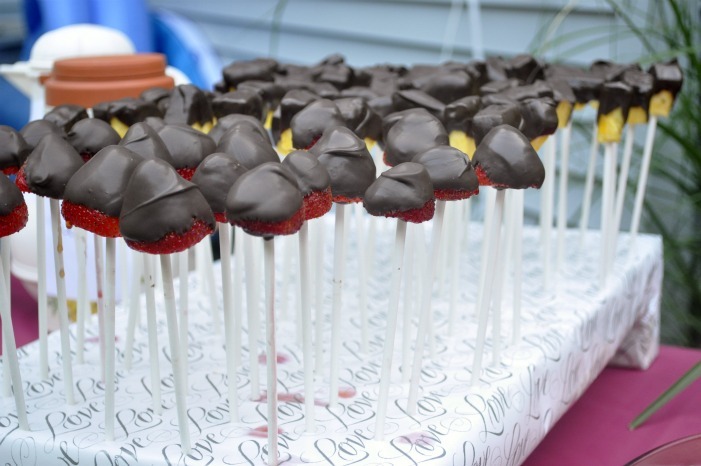 Then, place the popsicle sticks into the fruit and dip in the chocolate. (NOTE: I found that the flat wooden popsicle sticks work best on the strawberries. The thinner sticks tended to go right through the tops of the strawberries. I still made it work, but it was more time consuming and less precise than the previous time when I'd used the flat sticks). Place the dipped fruit into the wrapped styrofoam board to rest. I used a meat thermometer to 'pre-drill' holes in the board, but the popsicle stick should work well on its own too. They don't have to be perfect. I like them rustic. To make the marshmallow dip, beat the cream cheese for 30 seconds in the bowl of a stand mixer or with a hand mixer. Add the marshmallow fluff and beat until combined. Add the confectioners sugar, 1/2 C at a time until completely mixed. Stir in the vanilla extract. Give a few more mixes for good measure. 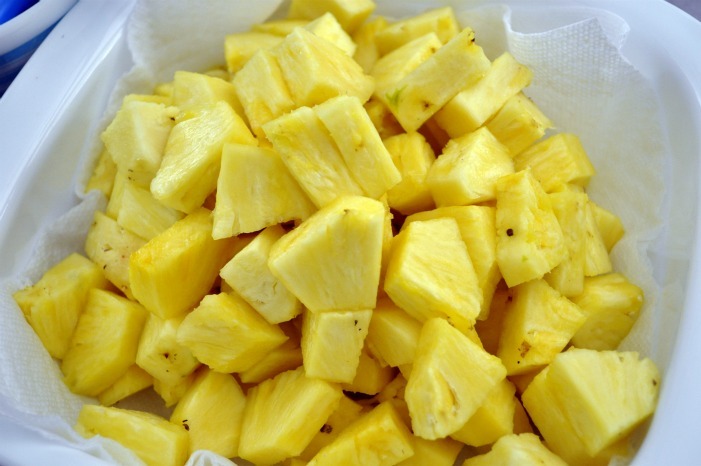 Transfer to an airtight container and refrigerate for 3 hours before serving. Transfer to a cute bowl and display near the fruit. Dip the fruit into the marshmallow sauce. It's so good. You can't eat just one. I promise. What's your favorite easy yet glam dessert? I love how these pops are seemingly luxurious but are really so easy peasy! What are your at-home remedies for feeling better? Please send help! psst...Kimberly's blogging about being unplugged during Hurricane Irene...head over to The Peach & The Pit to share your Hurricane stories!